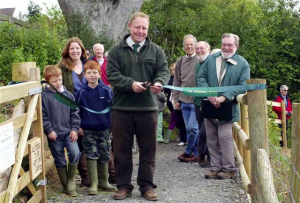 Following the success of the Woodland Park, The Bridford Trust embarked on another project to enhance the enjoyment of the local countryside by Bridford residents and visitors alike. The project involved acquiring a nearby area of mature wet woodland – Rowdon Valley Wood, setting up plans to conserve the habitat and making an access route through it. This woodland of 2 acres is just across the road from the Woodland Park, in the valley occupied by a small stream which drains the above fields and flows down behind the village hall, skirting the grounds of the Old Rectory to eventually join the Rookery Brook. Monty and Sue Cox originally owned this hidden area and enjoyed the peacefulness after a wet and difficult scramble down. The Trust was pleased when they offered this strip of land but were concerned about the work needed to make a safe footpath. Mr and Mrs Wastenage owned the adjoining land and offered a piece as a permissive path to avoid the wettest part. David Price drew up the plans to include wooden bridges and to build up parts with stone. The path was completed by dozens of working parties. Thanks to a lot of effort filling forms and chasing grants, we were fortunate enough to secure the funding to purchase the land in December 2007. So, early the following year we started the daunting task of tackling the conservation of this special habitat and of constructing a footpath through the wood. The initial work was concerned with just clearing a route through the tangled mass of vegetation and fallen trees. With enthusiastic use of saws, loppers and billhooks by various volunteer groups and working parties we managed to find a route through dense tracts of vegetation that at times could have come straight from J R Tolkein. Much of the wood is very wet – you sink to your ankles (or worse!) in many places, so the task of creating a footpath through here, whilst minimising the impact on the habitat, was both an engineering and conservation challenge. Thanks to Peter and Di Wastenage allowing us to put a permissive path through their adjoining dry land, we were spared the problem of having to go through the wettest part of the wood. So, with a mix of bridges, boardwalks, rocky causeways and lots of back breaking effort we have managed to create what we hope is an attractive and environmentally sympathetic path through this amazing woodland. It is the 9th May 2009 and Mr and Mrs P. Wastenage and family cut the tape, officially opening the Rowdon Valley Wood path. 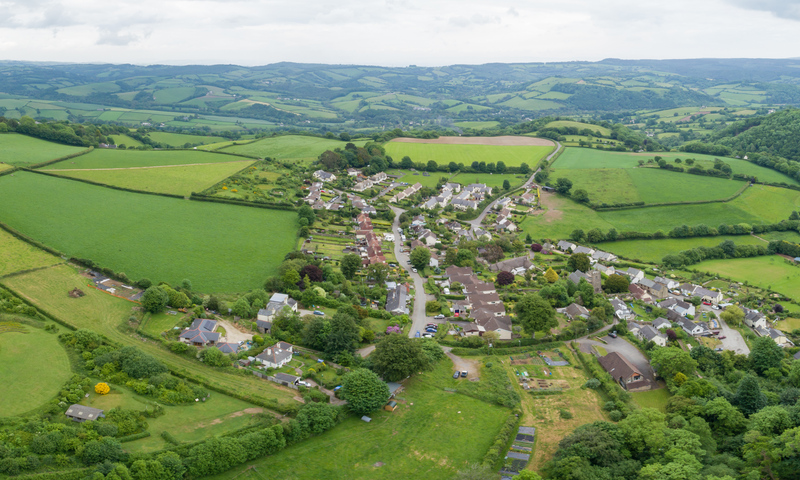 The path runs from “Brooks Garage” junction (where the Moreton Road forks off the Reservoirs Road) through to Church Lane next to the Village Hall, and combined with the Woodland Park route offers a circular walk through a variety of typical Dartmoor scenery and habitat . The extract below from the Environmental Management Plan identifies the main features of the woodland and the activities which were involved in each to satisfy our project objectives.